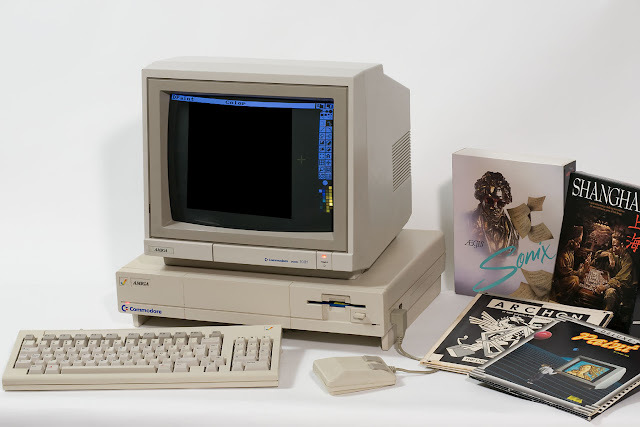 Launched 30 years ago this month, the Commodore Amiga was an early 32-bit computer that featured dedicated graphics and sound chipsets and is widely regarded as the first multimedia computer. It was also a highly expandable system running on an efficient operating system, and as such it was one of the key contenders in late 1980s and early 1990s home computing. Starting off with the original Amiga 1000, the popular Amiga 500 followed on in 1987 and continued on through several models until Commodore's bankruptcy in 1996. Afterwards other Amiga models appeared from other manufacturers with different processors and upgraded operating systems, but these were strictly niche products for Amiga fans looking for an upgrade. The currently-available derivative is the AmigaONE X1000. Easily outclassing everything else on the market, the Amiga launched at a time when the IBM PC was taking the lion's share of the market. Nonetheless, it was a successful product for its time and is fondly remembered by owners. In a wider context, the Amiga showed the value of adding dedicated hardware for multimedia where before all processing would have to be done by the main CPU. Effectively the Amiga line was the first widely available system to feature a dedicated GPU, something that is commonplace today in smartphones and tablets. As an aside, the Commodore name has been revived several times, and the company currently bearing the name is in the process of launching the Commodore PET smartphone, named after Commodore's influential 1970s computer line.